“Especially stews and soups,” the seasoned Island chef said one recent morning while he was shuffling between his food truck parked at the Airport Business Park and his newer home base, Offshore Ale Co. Aronie recently stepped in to help start a catering business and manage the kitchen at the Oak Bluffs staple. “I’ve been making some changes to the restaurant menu at Offshore to reflect more of who I am as a cook,” he said. 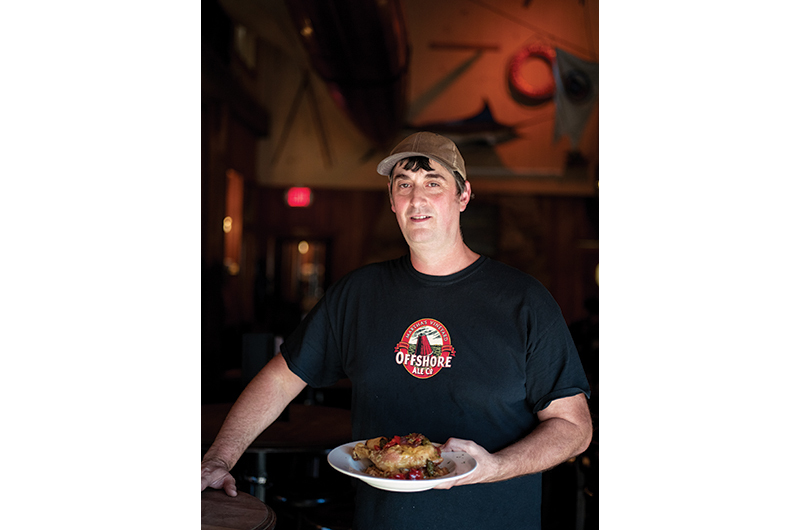 And as a cook, from the Menemsha Café to Café Moxie to the food trucks he runs year-round, Aronie is known for satisfying well-seasoned food, especially soups and stews. Ever tried a chicken cassoulet? Order his version at Offshore Ale. Aronie is a cook who takes no shortcuts. It’s not quite as thick as a stew or as thin as a soup, but it does have a tucked-on-the-corner-of-the-street-in-a-small-town flavor profile. “I’m trying to put out food to be more pub-like, as if you were to happen into a beer pub in Scotland, you would get something like this, something warm and inviting,” he said. “A good hearty chicken dish,” he added. With a little more than a touch of comfort.